This is our review of 12VPN based on our real tests from China. In addition to our 12VPN review, we have also reviewed a number of other VPN services. If you are looking for a reliable VPN services to be used in China, Please also read our list of Best VPNs for China. Good connection and fast speed. No limit on number of simultaneous connections (as long as not connecting to the same server). No live support. Only email support. 12VPN is a VPN provider based in Hong Kong. It’s not a big player, but being small and being close to China gives this provider certain advantages. 12VPN seems to have strong experience serving China users. Based on our tests, we confirm that users can sign up for 12VPN’s services from China and 12VPN’s VPN service can be used in China. 12VPN seems to have strong experience serving China users. On their website you can find special sections with instructions and tips on using 12VPN in China. In addition to common payment methods such as credit cards and Paypal, 12VPN also accepts Alipay for payment, which should be convenient for VPN shoppers in China. In the customer support emails we received from 12VPN, there’s a small note written in Chinese saying that users can use Chinese to communicate with them, which is quite impressive. In addition to the regular VPN protocols, 12VPN also provides two connection methods designed specifically for China: OpenWeb China and China Hybrid. With the OpenWeb China method, when you visit China websites such as Baidu, Weibo, Taobao etc. from China, the traffic will NOT go through VPN, making it faster to visit local websites. This feature turned out to be very useful. With other VPN providers, when you are connected to VPN, China websites such as Baidu and Weibo would become slower to load, because the traffic has to go through VPN and then come back. With 12VPN’s OpenWEB China option, only international traffic goes through VPN while China traffic untouched. This way you can still load China websites at a fast speed. 12VPN has server in 16 countries around the globe, including US, UK, Hong Kong, Japan, Singapore and more. Users can choose one of the three ways to use 12VPN: VPN, Auto-proxy and SmartDNS. For VPN, users are given a number of protocol options: OpenWEB, OpenWEB China, OpenVPN, OpenVPN TCP, China Hybrid, Secure DNS, No Routing, StealthVPN, StealthVPN TCP etc. Note that a number of those options are designed specifically for China users. For example, the OpenWEB China options tries to exclude Chinese websites from the VPN. This allows for a very fast local experience when you’re in China while still unblocking and securing non-Chinese websites. In addition to VPN, 12VPN also provides auto-proxy service, which can be set up on individual web browsers or on the whole operating system (OS/X and Windows). 12VPN users can also use their SmartDNS, which can be set up on Apple Airport, Apple TV, supported routers, OS/X and Windows. While most VPN providers limit the number of simultaneous connections to 1 to 3 devices, 12VPN does NOT have this limitation at all. It can be used on multiple devices at the same time. However, In some cases it may be necessary to connect each device to a different server to avoid conflicts. It should be pointed out that 12VPN doesn’t allow Torrents. If you want to use VPN for this purpose, 12VPN is not a good choice. 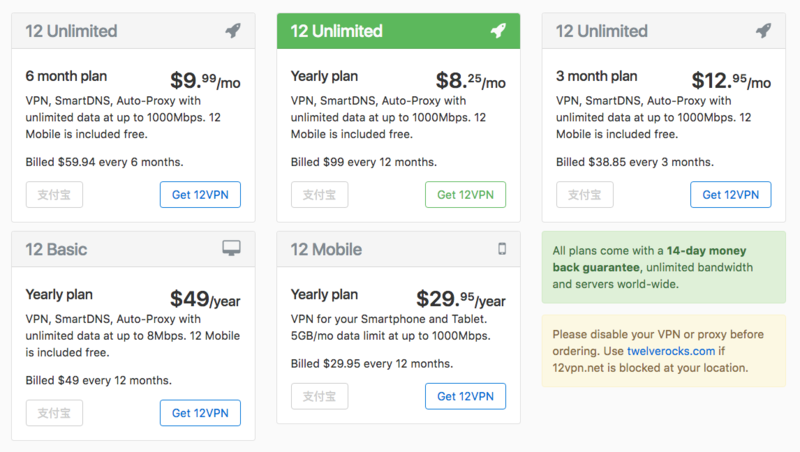 12VPN offers 3 plans: The “12 Basic” plan ($4.08/mo) comes with unlimited data but a speed limit of up to 8Mbps; The “12 Unlimited” plan ($8.25/mo to $12.95/mo depending on billing cycles) comes with unlimited data and speed up to 1000Mbps. The “12 Mobile” plan ($2.49/mo) limits the data to 5GB per month. Each of these plans comes with a 100% money back guarantee for 14 days. 12VPN provides software for many platforms, including Windows, Mac, Linux, IOS, Android, BlackBerry, Windows Phone, Chromebook etc. They also offers detailed instructions on how to set up VPN manually on those devices without installing any software. In addition, 12VPN offers instruction on how to set up VPN on supported routers. We downloaded their desktop client for Mac OS. The installation process was straight-forward and the software interface is clean and intuitive. With the desktop software, you can connect/disconnect to VPN and also change servers and switch connection methods. When the 12VPN client software is running, an icon will stay on the menu bar (or called system tray on Windows), and it will indicate whether you are currently connected or not. During our tests, we found 12VPN’s connections seem to be pretty reliable. It was very fast to connect/disconnect and when connected, the speed is very good. Unlike many big VPN providers, 12VPN doesn’t have a live chat option for talking to their customer service. Users have to use email to communicate with customer support representatives. In addition, they provides a U.S. phone number for leaving voice messages. We tried sending a customer support request via email. We received a reply via email after 1 hour. 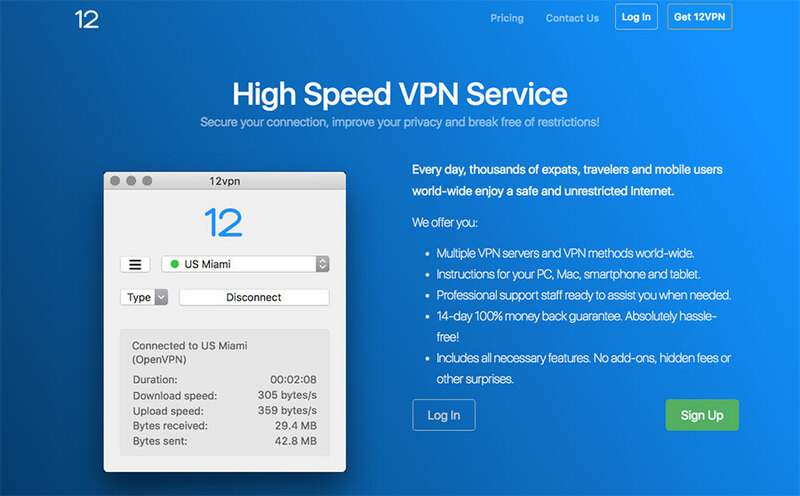 12VPN is a not a big player, but it does offer good VPN service with reliable connections and fast speed. In addition, they seem to have strong experience serving China users. Based on our tests, we recommend this VPN provider and have included it in our Best VPNs for China list. This entry was posted in VPN Reviews and tagged 12vpn, review. Bookmark the permalink.